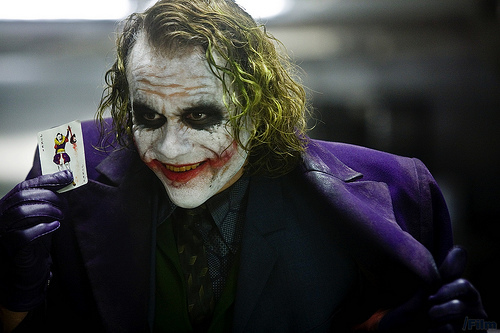 But I’d take it a few notches further and say that The Joker is the film’s “inverted social conscience,” the dreaded, deadly disease that makes society work together to find a cure. It is he who asks the hard questions, he who challenges the taken-for-granted assumptions, he that pushes humanity to see how low they would really sink—or how far they could really rise. He is the ultimate “necessary evil” that forces us to see just what we’re really made of. A composite of everything that is wrong, perverse, and twisted in our society, it is he who nonetheless shows us our true potentials for greatness. It just goes to show that, in the movies—as well as in politics and the rest of real life—there’s a lot we can learn from the bad guys. We cannot simply turn our eyes away from them, or pretend they’re not there, or make believe that they will simply go away. They will not—for they are here to stay. But instead of ignoring them because they’re such “bad examples,” we should study them, dissect them—even if we don’t understand them—and see how we can stop the rest of the world from joining their ranks. Crooks (trapos included) DO have a purpose. They’re there to show us what can happen if we let ourselves slide too deeply. Which brings us to Lesson # 2: Harvey Dent. Lesson #3: When push comes to shove, trust people to do the right thing. Speaking of the ferry scene, another point the movie made very well was that everyone, even the lowest scoundrels of society, has some emergency button of goodness within them that they can access and activate even at the most desperate times of their lives. Just give them a compelling reason and just enough time (but not too much) to think through their decision, and people will almost always gravitate toward the good. I’m no expert in human behavior and so I cannot vouch for this as truth, but I believe that when we put our faith in people—and they know how important their choices will be for everyone else on board—they will do their best to make the right decision. It won’t be easy, but it’s possible, even outside of Hollywood. Lesson #4: Sometimes, the “right thing” (or person) is difficult to understand, or even recognize. How will you know that you’ve done the right thing? How will you know that you’ve chosen the right person? You won’t—not at the onset, or not always. Because, sometimes, the person whom you thought was the answer will leave you disappointed and asking more painful questions. If Harvey Dent had lived and had been allowed to unleash the fullness of his newfound glory upon Gotham, what would have happened? We don’t know for sure, but we do know that we cannot allow something like that to happen HERE. We cannot allow ourselves to be bought by the winning smile, the boy-next-door look, or the Messianic pronouncements. Even when looking at one’s track record (as in Harvey Dent’s case), we have to go over every detail very, very carefully. Conversely, we also cannot simply discount the “dark horse” as a nuisance entity or a subversive force that must be stopped. It’s possible for the totally misunderstood rebel to be exactly what we need. Sometimes, collective understanding arrives so slowly that we are not able to recognize a hero when we see one. So we cannot trust our gut or our intellect alone. When looking at people we need to understand the context of their actions, and also the context of the decisions we need to make. In Gotham, as in real life, nothing is truly black or white. Lesson #5: Sometimes, we need to live with lies in order to find our truth. Nobody understood this better than Batman himself. He has had to perpetuate a lie in order to allow justice to prevail, even allowing Two-Face to be seen as the Knight in Shining Armor that everyone needed him to be. Sometimes, we need to live with a lie in order for truth, justice, and goodness to prevail—so that the delicate threads that weave our social fabric do not disintegrate and explode into chaos. The challenge, then, is discerning which lies we need and which ones we should never entertain. Filipinos dared to ask: Why not?